Today’s post is from Sandra Glascock, assistant archivist at the Rakow Research Library. 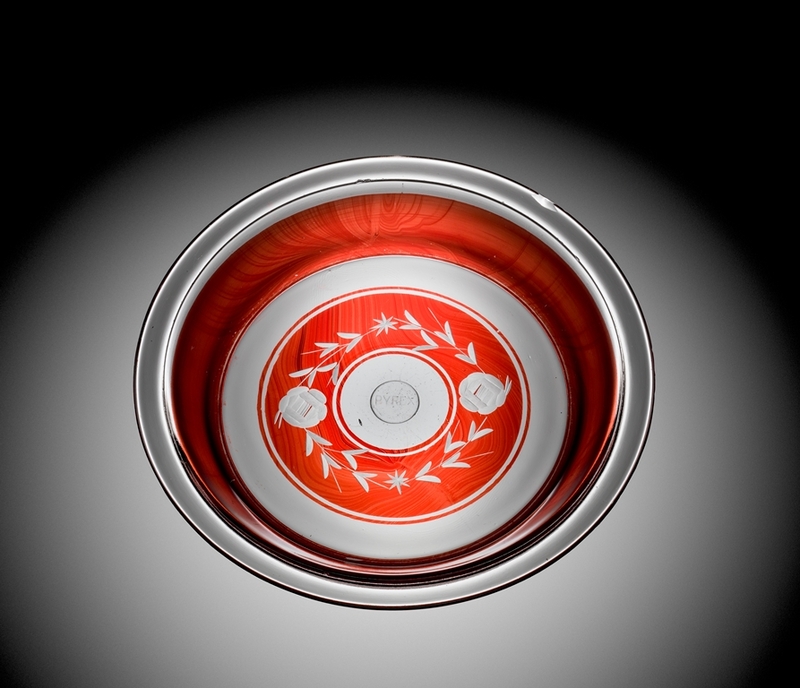 In 2010, The Corning Museum of Glass acquired a wonderful collection of Pyrex glass and research from Dianne Williams, who spent nearly a decade building her collection. She amassed 1000+ pieces of Pyrex Ware—including casserole dishes, bread pans, pie plates, ramekins, teapots, nursing bottles, platters, measuring cups, carafes, skillets, percolators and mixing bowls. She also collected original advertisements, displays, recipe cards and promotional items. These print materials make up the bulk of her research collection, “The Dianne Williams Collection on Pyrex, 1915-2010” housed in the Rakow Research Library’s Archives and Special Collections. (See many of these items on Pyrex Potluck Uncovered.) One of my recent projects as assistant archivist at the Rakow Library was to process this collection and create a finding aid, or index, so that researchers can easily discover what is available in Dianne Williams’ papers. I spoke with Dianne to learn more about her Pyrex journey. Dianne’s son was interested in acquiring antique cut and pressed glass and, out of curiosity, Dianne accompanied him on several of his collecting trips. What caught her eye in the antique stores, flea markets and garage sales they visited were the colorful patterns and nostalgic charm of Pyrex Ware. Dianne was hooked. Beginning in 2002, she made it her mission to acquire Pyrex pieces in the best condition. 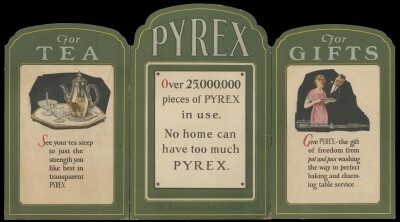 She was interested in how these objects were presented and sold to the public, so she began to collect ads and other Pyrex ephemera. After scouring the local stores of her hometown—Port Angeles, Washington—she started traveling to every corner of the Pacific Northwest in search of items. 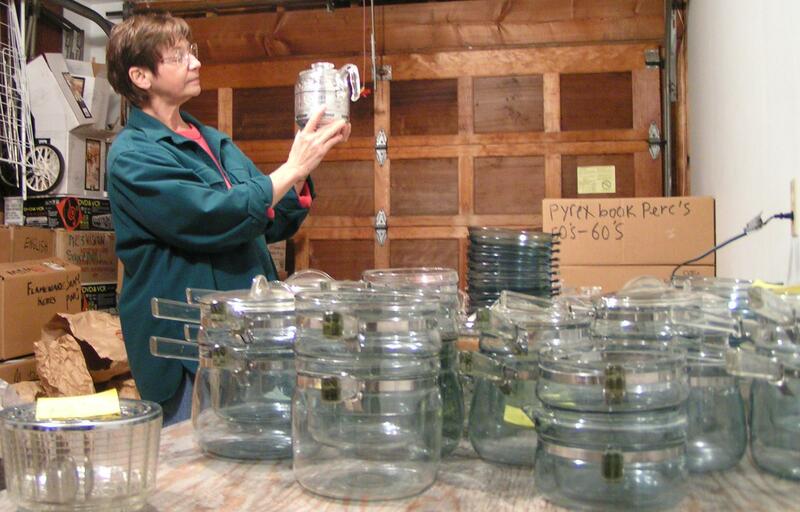 She became known to vendors as “The Pyrex Lady.” She used eBay to track down Pyrex and was soon skilled at bidding wars. She also visited the Corning Incorporated Archives twice in order to compile a complete history and chronology of Pyrex objects. Dianne was determined to collect every piece of Pyrex available, and she almost did—only the oldest baby bottle, an iced-tea set and electric irons escaped her. Plate, Corning Glass Works, made in Corning, NY, 1936. 2010.4.206. Before long, every inch of Dianne’s house was covered with Pyrex and she was running out of space to store her treasures. She converted her two-car garage into an informal museum. She was able to display the objects—or “her children” as she liked to think of them—on shelving that covered three walls of the garage. Her visitors could now view the collection in its entirety and see the amazing diversity of the Pyrex brand. Dianne also wanted to create a comprehensive collector’s guide from all the resources she had acquired during her journey. 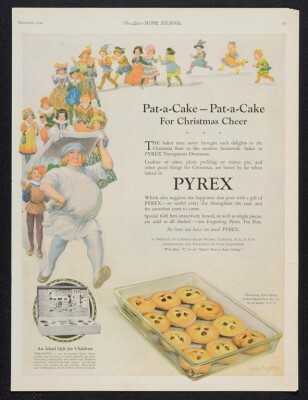 Using trade catalogs, price lists and magazine advertisements she collected, she developed a guide with details on every pattern and feature of Pyrex Ware. The book remains unpublished, but her manuscript is available to read as part of her archival collection at the Rakow Library, and is the basis for much of the research on the Pyrex Potluck website. Dianne sorting her Flameware objects. Courtesy of Dianne Williams. Running out of places to store her objects and feeling as though she had successfully completed her mission to assemble a complete collection of Pyrex, Dianne decided to stop actively collecting in 2009. She approached Tina Oldknow, senior curator of modern and contemporary glass, to see if The Corning Museum of Glass would be interested in obtaining her collection of objects and print ephemera. The Museum acquired the complete collection in 2010. See Pyrex items from the Dianne Williams collection on view through March 17, 2016 in the exhibit America’s Favorite Dish: Celebrating a Century of Pyrex.